I really have a thing for pumpkin pie. It happens to be my favorite pie at Thanksgiving. I do have a soft spot for apple pies and I will not turn down a slice of pecan pie. But there is something about a pumpkin pie! I know many of you have been busy all week prepping for Thanksgiving tomorrow. 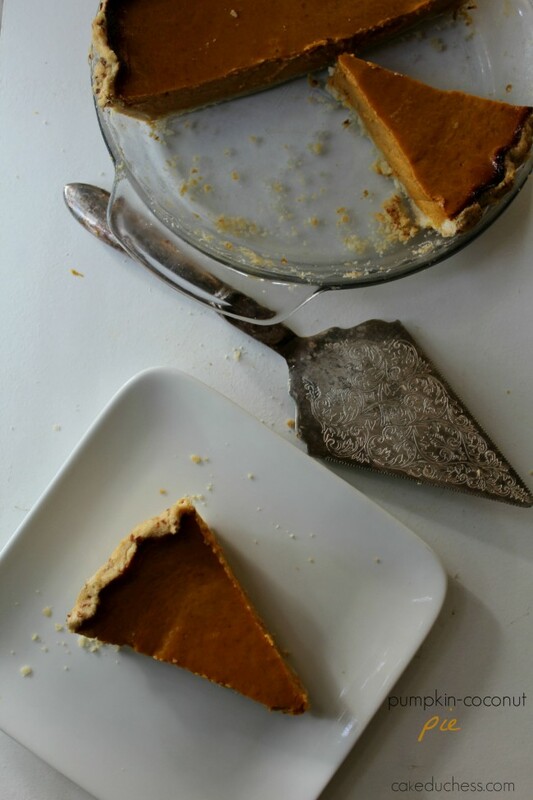 In case you haven’t found a pumpkin pie recipe yet, you may want to try this one. Especially if you are a coconut lover! If you want a more traditional pie without coconut, I have this one for you. Try the maple whipped cream recipe I shared with that recipe…amazing! 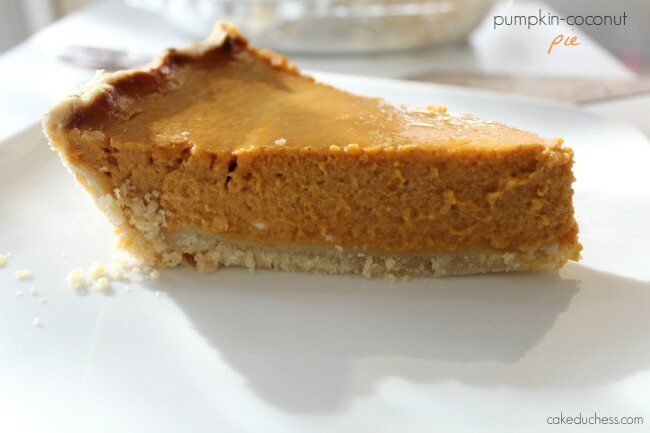 Are you looking for a dairy-free/vegan pumpkin pie, this one is a hit! And it’s not just me. My kids request a pumpkin pie on a weekly basis once they know that it is pumpkin baking season over here. I do oblige and I just love the scent of the pie baking. For those that do not prefer to make your own crust, you could use a ready-made crust. It’s not that difficult to put together your own crust and the flavor surpasses a ready-made crust. It’s ok if it doesn’t roll out perfectly and it’s ok if it shrinks a little while baking. Honestly, nobody will notice. They will just be oohing and ahhhing over your amazing pie! Really, I know they will!! I love this crust recipe because you add coconut to the dough…and when you take a bite you can taste sweet coconut bits. If you’re a coconut fan, it’s incredible! 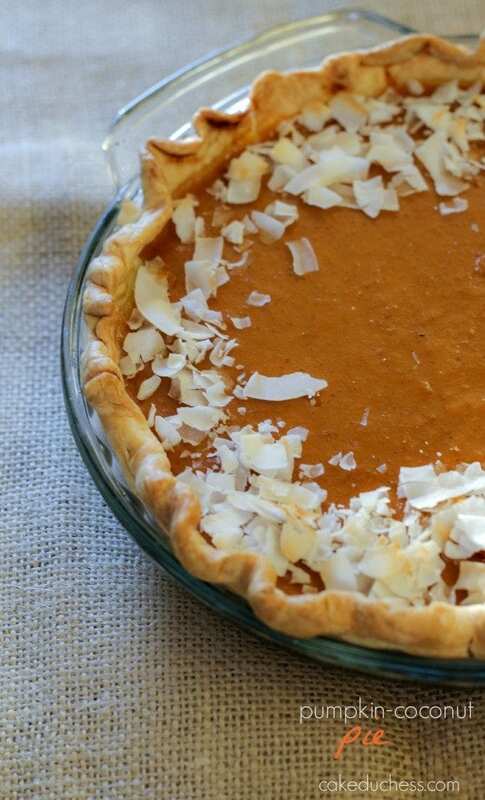 If you’re not such a coconut fan, you can omit the coconut in the dough for the pie crust. The recipe I found in Food Network magazine also adds 1 Tablespoon of coconut rum to the filling. I omitted it in my recipe, but if you have the coconut rum on hand, I bet it will taste fantastic! I like to make my pie dough in my food processor. It just comes together easier for me like that. I also make my dough (pasta frolla) for my crostatas in the food processor. Once it reaches that consistency where you know you could work with it, it’s ready. If it’s too dry, you have to add a little more iced-water. I just stop my processor while it is blending it together a couple of time and check how the consistency is going. I know you can get a better handle of the dough process if you work with it in a bowl. But like I said, I just prefer to use the processor. Here is a great link I’ve shared before on how to make your dough for a pie crust. Kate is the queen of pies! Here is a link explaining why you should blind bake. A very Happy Thanksgiving to all my friends! I’m grateful for all of you!! the mixture just begins to clump together. stay for up to 2 days in the refrigerator. minutes to get to the perfect rolling temperature. into plate, pressing firmly against bottom and side. least 2 inches all around. firmly against bottom and side. scissors to trim the dough to within 1/2 inch of the lip of the dish. edge of the pie crust. minutes. Transfer to a rack and cool completely. with your homemade whipped cream.